Kevin Kolsch and Dennis Widmyer's much-anticipated remake of Stephen King's Pet Sematary crawls out of the grave and into your local movie theater next month. Like many of the rest of you guys out there, I missed the film's World Premiere at the SXSW film Festival earlier this month, and so I'm counting down the days until I can sit in a crowded theater and see it reborn for myself. And while we wait, today we already have word that further films may be in the works. Not a sequel mind you, but possibly a prequel if we can believe producer Lorenzo di Bonaventura, who recently said this. "I generally don't start thinking about [sequels] until they're a success. I think if there's anything here, there's a prequel. I think if you look at the book, we didn't cover all that stuff that happens before the Creed family moves in. So, I think there's a movie there, and I think I'd be particularly interested in doing that, because, again, it's the source material and you are going toward something that also has a lot of crazy, creepy feelings about it." Huh. As you can see above, Bonaventura says they didn't cover all "that stuff" that happens before the Creed family moves in from Stephen King's source material. But as a super fan of not only the original 1989 movie starring Dale Midkiff, Denise Crosby, and Fred Gwynne, but also King's novel, I'm having a hard time figuring out just what "stuff" he's talking about. Granted I haven't see the remake yet so I don't know if they cover things such as Timmy Baterman and his father, but other than that what is the producer speaking about? Young buck-toothed Jud and his dog that got caught in barbwire? Hell if I know. 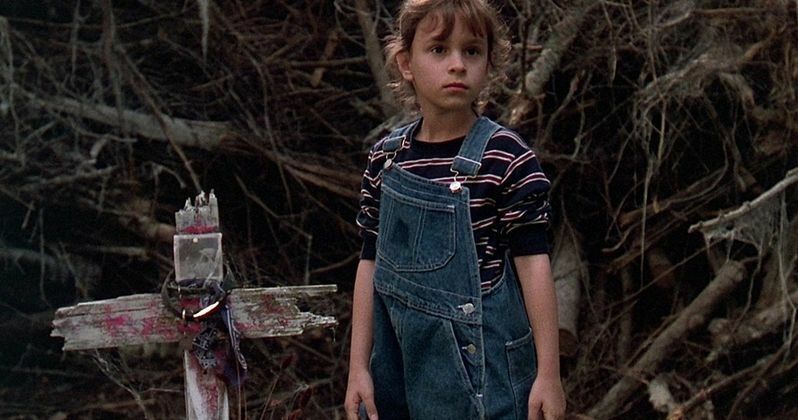 That said, if I do peep the new Pet Sematary soon and it doesn't feature the twisted tale of Timmy Baterman, then I'm all for a prequel as that subplot alone is super creepy. For those who might not know, the tale of Timmy Baterman goes a little something like this. Timothy "Timmy" Baterman was the first human buried in the cemetery. The story goes that he went to war to fight the Nazis in 1941 and was shot dead. His body was shipped back to the town of Ludlow, Maine and his father went insane with grief. As you might imagine, it isn't long before Papa Baterman buries little Timmy in the sour ground of the Micmac Burial Ground and before you know it, Timmy is back... kinda. You see, the burial ground infected and possessed Timmy with the dark magic of the Wendigo, and now Timmy is walking the streets of Ludlow, scaring people to pure-death. So young Jud and five men go to Bill's house and set the place on fire - with Timmy and Papa Baterman still inside. It's one hell of a story. I figure they don't want to go down the road of a sequel once again based on the fact that the film industry has already been there and done that before with original Pet Sematary director Mary Lambert's 1992 sequel Pet Sematary Two. That film starred Edward Furlong (Terminator 2: Judgment Day), Anthony Edwards (Zodiac), Jared Rushton, and Clancy Brown (The SpongeBob Movie: Sponge Out of Water) and wasn't nearly as big of a hit as the original 1989 movie. In fact, Pet Sematary Two only gathered $17.1 million at the box-office and snagged a sad 25% approval rating over on Rotten Tomatoes. New Pet Sematary hits theaters on April 5th. This story comes to us via Consequence of Sound.